WHEN: March 31 – April 23, Fridays at 8 p.m., Saturdays at 8 p.m., Sundays at 4 p.m.
TICKETS: start at $15 and are on sale now. For more information, call (410) 662-9455 or visit http://www.baltimoreshakespearefactory.org. 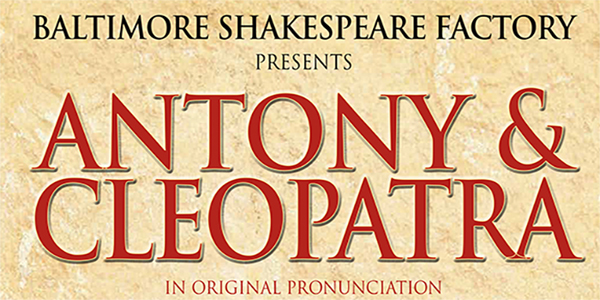 BSF’s presentation will be the very first time that modern audiences will be able to hear Antony and Cleopatra spoken the way Shakespeare's audiences would have heard it when it was first performed in the early 1600s. This will be the third consecutive season in which BSF has produced a play in OP. In keeping with the company's philosophy to produce the works of Shakespeare using the staging conditions of his time, the company plans to continue performing at least one play in OP each season, making BSF among the world’s foremost producers of OP Shakespeare. Worldwide, less than twenty OP productions have been mounted since the 2004 Globe Theatre production of Romeo and Juliet revitalized interest in that type of Shakespearean performance. Considered by some to be the greatest love story ever told, Antony and Cleopatra is a sweeping epic that pits East against West in a battle that shaped a new world. The play offers keen insight into timeless themes of love, honor, and power that are still relevant today. BSF’s associate artistic director Chris Cotterman and Valerie Dowdle play the title roles, respectively. BSF founder and artistic director Tom Delise directs this production. With its commitment to presenting OP productions, BSF continues its relationship with OP experts David and Ben Crystal. Accent and dialect expert Paul Meier joins their advisory board and will consult on this production. Meier is a Shakespeare scholar, teacher and coach. His Voicing Shakespeare ebook addresses the linguistic challenges of Shakespearean language. As a member of the BBC Drama Repertory Company, Meier acted in more than a dozen of Shakespeare’s works. In his teaching at universities and conservatories, and in his classes at the Shakespeare Centre in Stratford-upon-Avon in England, he has trained two generations of actors in Shakespeare’s works. BSF productions are designed to help audiences understand and enjoy Shakespeare’s mastery of language and wordplay. The language of Shakespeare's works is the cornerstone of their artistic and literary merit, and BSF takes great pride in paying meticulous attention to that language in order to deliver it in such a way that makes it accessible to modern audiences. BSF productions are not notion or concept driven—e believe the language that Shakespeare gave us is all an audience needs to appreciate these works. Baltimore Shakespeare Factory (BSF) is dedicated to bringing the works of William Shakespeare to life for audiences of all ages and backgrounds. In Shakespeare’s time, the theater was accessible to everyone, and BSF prides itself on continuing that tradition by presenting professional quality work at affordable prices.